On Monday, February 10, the Daily Princetonian published an article about senior football captain Caraun Reid’s accomplishments and his opportunity to play in the NFL. The article relayed that Caraun is a special talent, but the photograph accompanying the article was not of Caraun from this fall’s victory over Yale, but of me jumping in the air. Not surprisingly, the congratulations I received for my impending fame and gridiron glory ran the gamut from sympathetic and understanding to completely clueless. The previous day, Samuel L. Jackson lit into entertainment reporter Sam Rubin for mistaking him for actor Laurence Fishburne during an interview about the movie Robocop. Samuel L. Jackson exclaimed, “We may all be black and famous but we all don’t look alike,” and when he was a mere tick away from a Jules-level turnup he added, “You’re the entertainment reporter and you don’t know the difference between me and Laurence Fishburne?” Translation: you’re that clueless or careless that for my interview you had the audacity to mistake me for another black actor? Furthermore, Caraun is known for his powerful pipes as a member of Old Nassoul just as much as he is known to be a devout Christian. Caraun is dynamic, and when he isn’t uplifting, he’s raising Hell on the football field. I’d say it is fairly reasonable to assume a good amount of people know of Caraun from various activities on campus. The incorrect photograph led to numerous jokes from friends directed my way. They were usually to the effect of, “Congratulations on the NFL Combine, Caraun!” It’s amazing how changing the inflection on any word of this sentence can portray so many different emotions about how the person felt about the article. I recognized ignorance, empathy, disgust, and an entire range of other emotions from people as they made light of the situation. Helluva start to the week. As I internalized congratulations from different folks I realized I was laughing more than I was becoming outraged. I laughed, because what else was I really supposed to do? I mean, I am being lumped in with another young black man that is accomplishing terrific things. Laurence Fishburne, Samuel L. Jackson; tomato, tomato? I’d even joke to friends that hopefully I’m going to get drafted by my hometown Jacksonville’s Jaguars. Samuel L. Jackson is one of the top ten highest grossing actors of all-time. 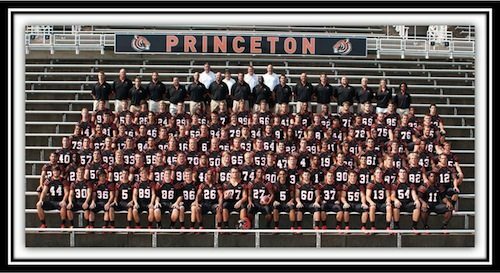 Caraun Reid is the first Princeton football player to attend the Senior Bowl since Holland Donan in 1951. I’m a retired football player easing into a regimen devoid of structured workouts, football meetings, and practice. It would be nice to be Caraun, but I’m not. It would be so much sexier to inform my parents that TFA is on hold because I can’t leave NFL money on the table. Alas, I am relegated indefinitely to amateur status and must descend into Dillon Gym to get a post-athlete pump in. Can you imagine the frustration with accomplishing the pinnacle of your profession, or having the opportunity to achieve your dream, and having your interview or article misidentify you based on carelessness and insincerity? When incidents like these occur—like actor Samuel L. Jackson being lumped with actor Laurence Fishburne, or black student-athletes like me being confused with Caraun—it reduces us to our race and ignores black male individuals’ accomplishments. “Due to an editing error, an earlier version of this article included a photograph of a player that was not Caraun Reid ’14. The ‘Prince’ regrets the error.” The online version of the article published the incorrect photograph just as the print edition did. Around midday Monday, February 10, the Prince removed the picture of me from the online publication. Afterwards, no picture of Caraun was uploaded to rectify the mistake. The Prince did not even contact Caraun or me at any point to apologize for the mistake. This is a profile piece on Caraun Reid and you don’t know what Caraun looks like? In the editorial about Caraun Reid, my friend did not get his just due. It’s important to understand the accomplishments, goals, and values each individual offers our campus community. Sam Rubin knew he was interviewing acclaimed actor Samuel L. Jackson live and mistook him for Laurence Fishburne. Similarly, the Prince’s editorial on All American Caraun Reid mistook him for me, albeit in newspaper form with time to edit the error online. Caraun represents the best that Princeton has to offer, but Caraun wasn’t afforded a representation befitting his outstanding individual accomplishments. Editorial competence and plain old attention to subject matter should have yielded the correct image of Caraun. I don’t mind being the Morpheus to Caraun’s Mace Windu, I just want the Prince to check out the movies first to know they’re different trilogies. No image search required. Correction: an earlier version of this article mistakenly identified the day on which the incorrect picture was taken down as Monday, March 10. It was Monday, February 10. The incorrect picture was taken down at 12:20 PM. I didn’t realize the Nass did corrections? This is the first one I’ve ever seen. But they don’t regret the error. So true! Such a good point, I forgot that you know the people who were involved with this and whether they regretted it or not! Go home. How the process works: sports editors tell photo editors the name and uniform number of the player they need a photo of, and photo editor searches through their archives for a player with that number. Malik and Caraun both wear number 11. It’s an awful error and very embarrassing for the Prince, and it should have been caught at multiple levels — and given that there are 11 pairs of players on the football team who wear the same uniform number, something they should be more careful about. But it’s not racist. The writer and editors responsible for the story know what Caraun looks like — this was a last-minute oversight at the end of the production process by people who only knew his uniform number. This is a totally valid explanation, but it seems problematic that little effort was apparently made to offer the explanation to Caraun or Malik. Mistakes can be forgiven, but the lack of an explanation, apology, or an effort to rectify the situation (even putting up a picture of Caraun!) is really what’s at fault here. Just want to agree with the other ‘Former Prince’ on here. Sometimes it’s really difficult to make sure a photo is of the correct athlete…the photo editor on duty is rarely the person who actually took the photos/was at the game, and often an athlete’s number is all there is to go on if you can only see part of their face. I can remember so many nights editing photos where I’d have to nervously run and get the sports editors to see if they agreed with me that the photo I was about to use looked like the person in the ‘goprincetontigers.com’ headshot. There needs to be better communication between the sports and photo departments, so that photo eds are made aware of any duplicated numbers in the lineup. I think this was most likely a case of a photo editor who didn’t realize there were two no. 11’s, and a sports editor who didn’t think to double check. This could have happened to any athlete with a duplicated number, male/female, white/black/etc. It’s terrible that this happened to Caraun, as he’s one of Princeton’s best both on the field and off. Hopefully the current editors go back and upload a photo of Caraun and make personal apologies. It’s not the first time the Prince has made an egregious error. Again, this is not an “egregious error” but a simple common one among news publications. Photos and content are handled by two different teams. The photo department was told they needed to find a photo of a player with a certain number, and there was a simple mix-up. A standard correction was issued – as is protocol for any news organization from your high school paper to the NYTimes – and the issue was done with. The idea that the current board should have “reached out” to personally apologize to this player for accidentally publishing his picture is ridiculous. Furthermore, this could just as easily have happened with a black and a white player or two white players or two hispanic players or whatever. To turn this into a race issue – or anything more than a simple 1 a.m. mixup by an overworked and tired little photo editor – is downright ludicrous. I can guarantee the photo editor was never told anything about the player’s race. This “article” is an embarrassing call for attention and completely misleading. Shame on the Nass for even publishing claims they surely know to be ill-founded. Well then… I guess I’ll just put down my pitchfork. Darn. I didn’t read this as mainly (or even secondarily, really) as an attack on the Prince in particular. It’s about race and public attitudes and so forth, and the Prince’s involvement is, in my mind, incidental No names were mentioned, and please-if you think any of us was immediately making the connection to some editor or another you are making a mistake. (It also is the case that this is a lapse in editing competence, as the article says, or a fault of process, race completely aside.) This piece was Malik reflecting on an experience and reporting his subsequent thought process. I am sure it was just a late night mistake. But even if completely random and unrelated to unconscious racial grouping (I don’t think anyone thinks it is an intentional act of racism) etc., it is interesting that that led to this set of experiences for Malik due to societal context, and so in any case it is worth us understanding the experience as a whole–the reactions he received, what he felt, and how he thought about it. So please: get over it, and let us enjoy a thoughtful and well-written article. Yeah…no. I think you misread it. One routine error that has nothing to do with race, this guy turns it into an eradication of black men’s accomplishments. Well, he’s talking about two routine errors, and I don’t think you get to be the person who decides how those errors have consequences for his experience or perception of his achievements. I don’t think you get to be the arbiter of whether that sentiment is legitimate or not once the error leaves the newsroom. He’s not just making a claim about his experience. He’s making a claim about an event. The commenter is entitled to interpret events differently. Let’s have the data on how many times this has occurred with white players before any conclusion can be drawn as to how “routine” it is. A reasonable person could read this article and conclude that the Prince’s error had something to do with the fact that Caraun and Malik are both black. I wanted to point out that under the current production cycle (which obviously is in need of revision), it likely had nothing to do with their race and everything to do with the fact that they both wear number 11. I do agree with the second part of your comment and think this is an important read because of Malik’s experiences afterwards, but I wanted to clarify that the Prince’s carelessness in this case was completely unrelated to race. I think it’s important to remember that this happened ALL the time during the announcing of the games. The black players were often referred to as one another. I honestly can’t even count the number of times that black players (with different numbers) were confused for one another. So whether this is just an issue of copy editing or whatever, it still stands true that this is a problem not just with the article in question. I second @football lover ’14. The number of times the announcers mixed up Jason Ray and Caraun. Or Trocon Davis and Brian Mills. It was really appalling and embarrassing.